2019 Calandro’s King Cake Information Roundup! It’s Mardi Gras. And that means KING CAKE! And there’s lots of it…everywhere. In 2015, we saw home bakeries, commercial bakeries, local grocery stores, big chain stores (ugh), donut shops, cupcake bakers, etc. all getting into the mix of making their own versions, styles, and takeoffs of the Louisiana Mardi Gras delicacy: King Cakes. In fact, in the last few years NOLA.com put together an interactive 2015 King Cake Guide and Map for Baton Rouge where you can check out all that our area has to offer in the way of King Cakes (Check out our video from NOLA.com’s guide below.) With each year since – from 2016 to today – its only gotten more creative and competitive out there. As the sheer amount and creativity of Mardi Gras King Cakes in Baton Rouge evolves and grows, its actually good for us and GREAT for you. 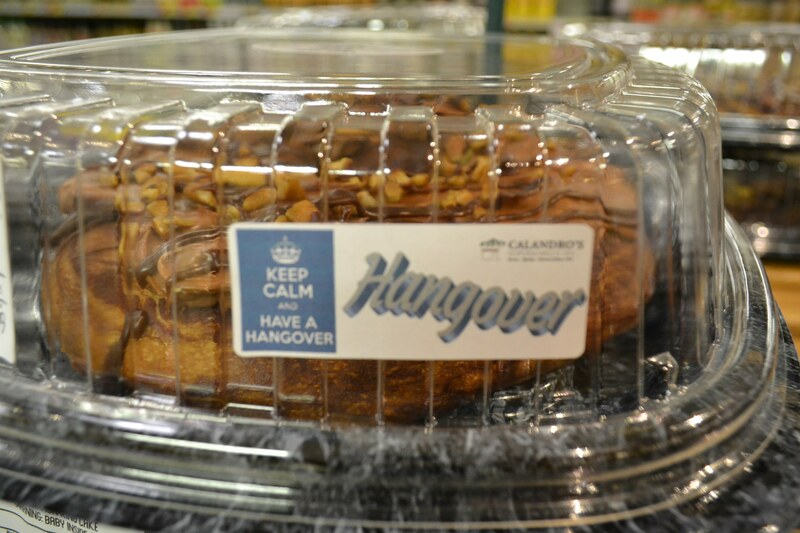 It forces Calandro’s to stay ahead, up our game, and generally just ROCK with King Cakes even more than in the past. So check out below for all of the details on Calandro’s King Cakes, and just how we’ve upped our King Cake game in 2019! 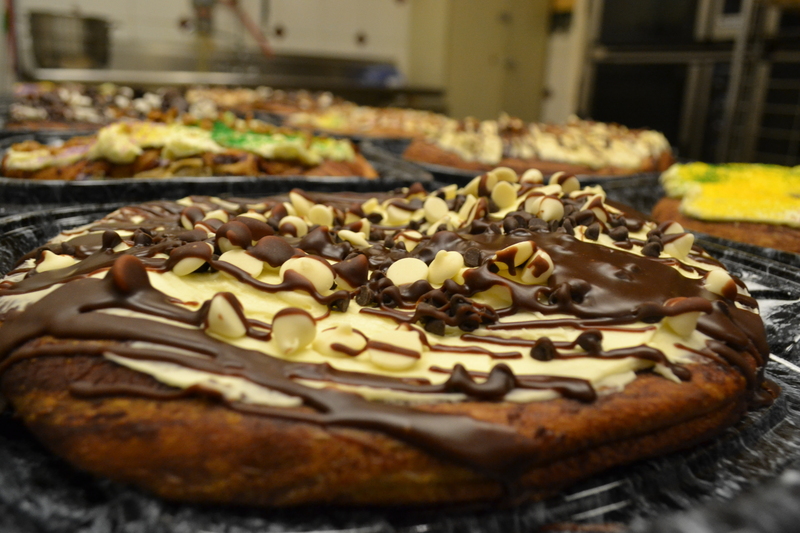 We set the trends for Baton Rouge King Cake flavors with usually 3-5 new flavors being tested and added every year. (BTW – that makes for 23 gourmet flavors, folks…and it contributes to well over 50 different flavors that we make throughout Mardi Gras. Nobody around here comes close to that!) 2015: Back in 2015 – we put out some exciting new stuff for sure – liquor cakes were the name of the game. The maply bacon-y goodness of the ‘Southern Belle’. The chocolatey, praline-y, liqueur-y yummyness of the ‘Big Easy’. A bit of coffee liqueur eccentricity in the ‘Hangover’. The lovely compliments of vanilla plus some real bourbon liquor in the ‘Bourbon Street’. And even the much heralded return of the ‘German Chocolate’ King Cake after a bit of a hiatus. If you’ve been shopping with us long enough, then you know that many, many moons and Mardi Gras seasons ago, we tried shipping King Cakes and it was a spectacular failure (unless the folks receiving the cake just couldn’t get over the incredible taste of ‘Calandro’s King Cake Pudding’). The combination of the stuffings, size, and heaviness of our cakes plus our lack of packing and shipping experience plus carriers that just didn’t know how to handle cakes carefully in transit made for a nightmare. So we got out of the King Cake shipping business for a long time. And we still don’t ship directly, but we have a solution for you that should be even better than that – read on… Now – years and years later, the carriers have gotten much better about handling King Cakes appropriately, and we have some good business friends down the street – AIM Mail Center @ Bluebonnet & Perkins – who are pros at packing and shipping King Cakes at a reasonable price (and handling the occasional shipping issue and claims that are still inevitable from time to time). They have partnered with us this year to handle the packing and shipping of any of our wonderful King Cakes to those who just can’t get to Baton Rouge to grab one themselves. All you need to do is come by Calandro’s and pick up the King Cake of your choice, and take it over to AIM at the address below, and they’ll be happy to get you the very best rates possible to where you’d like to get your cakes shipped. We’re posting this section from Facebook specifically to address what Patty pointed out in bold just above. We did not have anything posted up here to let people know that we don’t have all of our flavors all of the time on the shelves, and we do work our King Cakes in batches so sometimes we’re overflowing with cakes and other times we can be very low in stock due to very busy King Cakes sales and timing. Calandro’s Supermarket Patty – after some research on exactly what happened in this case, and as you and I discussed via Fb Messaging – I’m posting this as some suggestions for all of our customers, but especially for those of you like Patty who are coming in from out of town. Because of the popularity of our King Cakes over the past few years there are times of the day when we may be sold down in-between batches. It usually occurs mid-afternoon or close to closing time – especially on Friday, Saturday, & Sunday (super busy King Cake days) – as we usually will put out the big morning batch around 9-10am, and then follow up with another large batch in the afternoon from 3-4pm. As it turns out (and we hate that this occurred as it did), Patty caught us at exactly the wrong time & place. She was at our Government Street location (our smaller bakery of our two stores) in from out-of-town, around 2:30pm on a busy King Cake day (Friday) when they were trying to play catch up and get the afternoon batch out. So there were only a couple of King Cakes out on the racks and we feel terrible about this. 1. Special Orders: The best way to ensure we have the King Cakes you want, when you want them, is to make a special order at either of our bakeries (Government Street or Perkins Road). We can queue up any of our flavors for you and hold them behind the counter until you arrive so you’ll have the flavor you want, freshly baked and ready for you to grab when it works for you. 2. Timing: Our bakeries usually roll out big batches in the morning around 9-10am and then again in the afternoon around 3-4pm. As it gets closer to Fat Tuesday, we will sometimes roll out even more batches, but the times listed above are your best bet if you want to catch us when we’re flush with fresh King Cakes in our bakeries. 3. Multiple Locations: If you can’t make a special order, or you’re outside the timing above – stop through or call both locations – Government Street and Perkins Road. Both of our bakeries are wonderful, and make incredible King Cakes, but because of the smaller size @ Government Street (floor space & personnel) we roll out more King Cakes more often at Perkins Road, so if you’re strapped for time and can only stop one place – Perkins Road is probably a better bet just based on sheer volume. So Patty – please accept our sincerest apologies – for you and your co-workers up in Shreveport. We’re so sorry you all won’t be getting any Calandro’s King Cake this go-round, but at the very least, we hope to get another shot at your business, and thanks for helping us keep this from happening to anyone else who stops in from out-of-town during Mardi Gras for their King Cake fix. So there you have it. All of our flavors published. New flavors intro’d that push the King Cake boundaries even further. Even a shipping solution for our King Cakes to reach far outside of Baton Rouge. And Calandro’s King Cakes in the news! A good ole standard – our take on the Cinnamon King Cake.